Chlor SM Salt Chlorination Systems Get Sea Legs for Cruise-Ship Swimming Pools Specially Designed Exchanger Better Uses Sea Water to Eliminate Chlorine and Related Safety Issues - ChlorKing, Inc.
Norcross, GA Feb. 23, 2017 – With cruise ships floating on their raw material, ChlorKing® has introduced Chlor SM salt chlorinators with specially modified plates to sanitize sea water for onboard recreational water facilities. Tests on 10 cruise ships have shown a saving of 20 to 25 percent on pool sanitization expenses and an ROI of 18 months or sooner by eliminating the costs associated with buying and onboarding bulk chlorine, a ‘marine pollutant,’ and the need to store and handle it. They also eliminate the safety risks of fires or the creation of toxic gases that can be spread through a ship’s HVAC system. 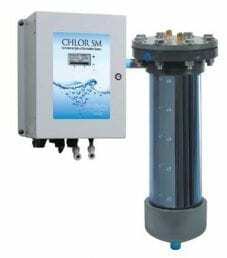 ChlorKing Chlor SM salt chlorination systems for ships are sized to produce 2 to 28 pounds of chlorine per day to sanitize pools ranging in size from 2,500 to 1,000,000 gallons. The new Chlor SM systems for ships are sized to produce 2 to 28 pounds of chlorine per day to sanitize pools ranging in size from 2,500 to 1,000,000 gallons. All are single units with a maximum footprint of 20 in. x 20in. for the power supply and 13 in. x 28 in. for the cell housing, representing a 50 percent size reduction and 33 percent weight reduction from previous models. Their compact size and lighter weight shorten installation time. ChlorSM chlorinators systems have fewer moving parts and maintenance requirements than traditional chlorine systems and a smaller carbon footprint. They are engineered specifically for the harsh environment of commercial pools and have an unmatched 10-year service life. The concentration of salt in pool water is one-tenth that of sea water, approximately 3,500 – 5,000 parts per million (ppm) as opposed to 35,000 ppm. While adding chlorine is considered the traditional way to sanitize swimming pool water, salt chlorination uses a proven 200-year-old technology, electrolysis, to convert salt to free chlorine to sanitize the water. In modern commercial pools, small amounts of salt are added to pool water, which then passes over a series of electrically charged plates that produce the chlorine. Ships can pre-set parameters to use their system’s reverse polarity to remove calcium buildup from the plates. 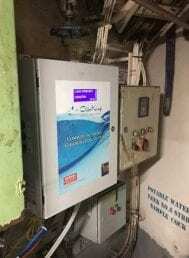 Compact ChlorKing Chlor SM salt chlorination systems for ships require minimal space. Maximum size for the power supply, shown here, is 20 in. x 20in. Founded in South Africa in the 1970’s, ChlorKing moved its manufacturing and distribution operations to Atlanta, Georgia in 1999. With more than 10,000 commercial swimming pool and water park installations worldwide, ChlorKing is the world’s leading designer and manufacturer of on-site chlorine generation and salt chlorination systems. The company’s patented technology produces large amounts of chlorine in a single cell, eliminating the need for banking multiple small cells. ChlorKing Inc., 6767 Peachtree Industrial Blvd., Norcross, GA 30092-3665. Tel: 770-452-0952 sales@chlorking.com www.chlorking.com.